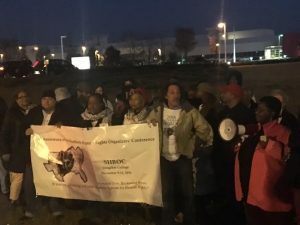 A growing number of workers at the Nissan car manufacturing plant in Canton, Mississippi desire union representation due to poor working conditions, low wages, and widespread safety issues that have lead to the death of two workers in recent years. By some estimates, as many as 40 percent of the 5,000 workers at the Mississippi plant have been hired as temporary employees who work for years earning significantly lower wages and benefits than regular employees. An overwhelming majority of temporary employees are African-American. Workers at the plant have been organizing their union, including building broad community support for over 13 years — and they aren’t backing down now. “We have bona fide civil rights concerns when it comes to Renault-Nissan and its poor treatment of workers in Canton,” said Derrick Johnson, state president of the Mississippi NAACP. When automakers receive large tax incentives from state and local governments to locate their facilities there, like the $363 million Nissan received for its Canton, MS, plant, they should be more engaged in treating workers fairly to create stronger communities for their workforce. The workers have been traveling the world to put pressure on Nissan to do-the-right thing. Most recently, a few workers traveled to France to meet with the government there, who owns 20% of shares of Renault-Nissan, which in turn is the largest shareholder of Nissan. In June, 35 French and European policymakers signed a letter asking Nissan to adopt a position of neutrality toward union organizing efforts in Canton. “Workers’ rights are, in fact, human rights. When I return to France, I will be informing the French government and the French President Hollande about the anti-union practices in Canton, ” stated Honorable Christian Hutin, member of the French National Assembly. Renault-Nissan declined to meet with Hutin, who recently visited Mississippi on a fact-finding mission. UE local 150 members shared our experience with organizing the Carolina Auto Aerospace and Machine Workers Union at the Cummins Rocky Mount Engine plant build a pre-majority union for 20 years. Even if the workers don’t win the upcoming union election, they should continue to maintain their union presence. Workers must always fight to have self-organization!